A musical evening of traditional and contemporary pieces presented by the renown Cradley Heath Male Voice Choir. 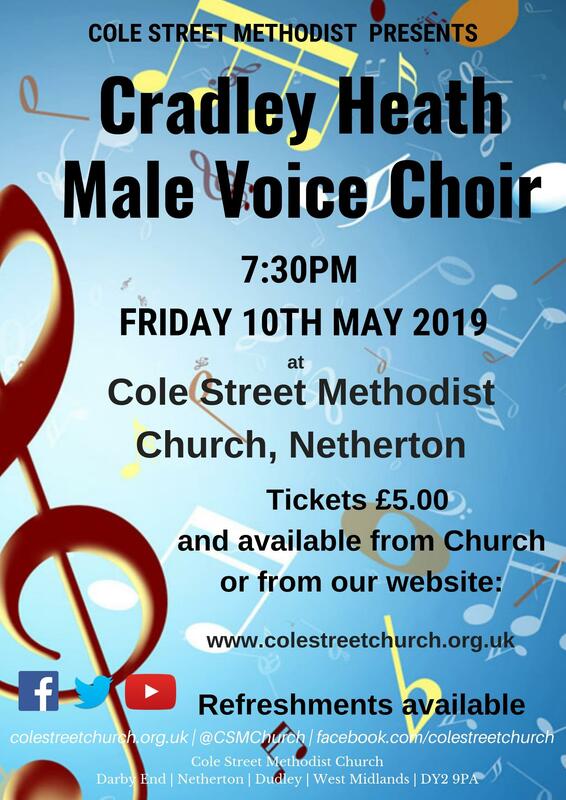 Join us at Cole Street on Friday 10th May at 7:30pm for a spectacular musical evening presented by the Cradley Heath Male Voice Choir raising money towards Cole Street Church funds. A spectacular evening is in store with inspiring and uplifting renditions of a variety of music to suit all ages and musical tastes including hymns, spirituals, show songs, pop songs, classical, opera and jazz as well as atmospheric lighting and special effects. Refreshments will be available as well as a raffle on offer.